International Space Station managers this morning gave a “go” for SpaceX’s Dragon cargo capsule to depart the outpost early Monday. Station astronauts Tom Marshburn and Chris Hadfield plan to pull the Dragon from its docking port with a robotic arm at 5:05 a.m. EDT, then release it into space at 7:49 a.m. Packed with 2,668 pounds of equipment and science experiments, the Dragon is expected to re-enter the atmosphere and splash down in the Pacific Ocean off the coast of Baja California at 1:19 p.m. EDT. Recovery ships will return the spacecraft to Los Angeles, and it will then be transported to SpaceX’s facility in Texas. The Dragon launched from Cape Canaveral atop a Falcon 9 rocket on March 1 and berthed at the station two days later. The mission is SpaceX’s second of 12 planned under a $1.6 billion NASA resupply contract. WASHINGTON -- More than three weeks after arriving at the International Space Station, the Space Exploration Technologies Corp. (SpaceX) Dragon spacecraft is ready for the trip back to Earth, now scheduled for Tuesday, March 26. Dragon's originally scheduled March 25 return date was postponed due to inclement weather developing near its targeted splashdown site in the Pacific Ocean. The additional day spent attached to the orbiting laboratory will not affect science samples scheduled to return aboard the spacecraft. NASA Television will provide coverage of Dragon's departure beginning at 4 a.m. EDT. Dragon is scheduled to be detached from the Earth-facing side of the station's Harmony module and unberthed by Expedition 35 Flight Engineer and NASA astronaut Tom Marshburn. Expedition 35 Commander Chris Hadfield of the Canadian Space Agency will back-up Marshburn and monitor Dragon's systems during the activity. Marshburn, working from the robotic work station in the space station's cupola, will maneuver the station's robotic arm for the release of the spacecraft at 7:06 a.m. Dragon will execute three thruster firings to move away from the station to a safe distance for its deorbit burn at 11:40 a.m. Dragon will splash down around 12:36 p.m. in the Pacific Ocean west of Baja California. SpaceX’s Dragon capsule will spend an extra day in space, after a forecast of poor weather near its Pacific Ocean splashdown site caused a 24-hour delay in its scheduled return home. NASA said Friday that the capsule will instead depart the International Space Station early Tuesday morning instead of Monday. Officials said the extra day will not affect science samples scheduled to return home in the capsule. Station astronauts Tom Marshburn and Chris Hadfield are scheduled to maneuver the station’s robotic arm to release Dragon at 7:06 a.m. Tuesday. Loaded with nearly 2,700 pounds of equipment and science experiment samples, the spacecraft is expected to splash down around 12:36 p.m. in the Pacific Ocean west of Baja, California. Since the shuttle’s retirement in 2011, Dragon is the only vehicle able to return significant amounts of station cargo to Earth. The Dragon delivered about a ton of cargo to the station when it arrived March 3, a day later than planned. The Expedition 35 crew members living and working aboard the International Space Station Monday were busy with final preparations for the departure of the SpaceX Dragon spacecraft set for Tuesday morning. They also worked with science and transferred cargo. The departure of Dragon from the space station begins at 4:05 a.m. EDT Tuesday, with release scheduled for 6:56 a.m. Dragon will conduct a series of engine burns to take it away from the space station with the third and final departure burn taking place around 7:06 a.m. NASA TV coverage begins at 4 a.m.
Dragon’s deorbit burn will take place approximately 11:42 a.m. with splashdown scheduled for 12:34 p.m. about 246 miles off the coast of Baja California. Dragon will take about 30 hours to return to port, at which point several critical science samples will be handed over to NASA for a return trip back to Houston that day. 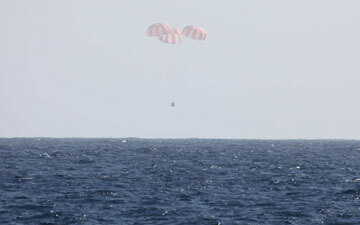 Dragon's return date, originally scheduled for March 25, was postponed due to inclement weather developing near its targeted splashdown site in the Pacific Ocean. The additional day spent attached to the orbiting laboratory will not affect science samples scheduled to return aboard the spacecraft. Aboard the station Tuesday, Commander Chris Hadfield and Flight Engineers Tom Marshburn and Roman Romanenko closed the hatch between the station and the Dragon capsule and installed a control panel between Dragon and the Harmony node to prepare for the separation of the two spacecraft. SpaceX has confirmed its Dragon spacecraft splashed down in the Pacific Ocean at 12:36 p.m. EDT a few hundred miles west of Baja California, Mexico, marking a successful end to the second mission contracted by NASA to deliver and return science investigations and other cargo to and from the International Space Station. Investigations included among the returned cargo could aid in food production during future long-duration space missions and enhance crop production on Earth. The SpaceX Dragon fired its engines for the last time Tuesday at 11:42 a.m. EDT sending it through the Earth’s atmosphere for a splashdown in the Pacific Ocean at 12:34 p.m. A team of SpaceX engineers, technicians and divers will recover the vehicle and its scientific cargo off the coast of Baja, California, for the journey back to shore which will take about 30 hours. Dragon's release from Canadarm2 occurred at 6:56 a.m. The Expedition 35 crew commanded the spacecraft to slowly depart from the International Space Station. Ground controllers earlier sent commands to the Canadarm2 to unberth Dragon from the Harmony node at 4:10 a.m.
Dragon's return date, originally scheduled for March 25, was postponed due to inclement weather developing near its targeted splashdown site in the Pacific Ocean. The additional day spent attached to the orbiting laboratory will not affect science samples scheduled to return aboard the spacecraft. NASA Television will provide coverage of Dragon's departure beginning at 4 a.m. EDT. The Dragon spacecraft launched atop the Falcon 9 rocket on the SpaceX-2 commercial resupply mission March 1 from Cape Canaveral Air Force Station in Florida. Two days later Flight Engineer Tom Marshburn captured the Dragon just 32 feet away from the station with the Canadarm2. Ground controllers then took over Canadarm2 operations and berthed Dragon to the Harmony node. Hatches to the commercial cargo craft were opened about four hours later beginning three weeks of cargo transfer activities. Station crew members swapped 1,200 pounds of cargo delivered to the station with 2,600 pounds of gear to be returned to Earth. Experiment gear and space hardware were delivered for NASA and its Russian, Canadian, European and Japanese space station partners. Over twice as much gear was returned including trash, station hardware and biological samples collected and stored in freezers during the course of research for analysis on the ground. Dragon is the only space station resupply spacecraft able to return a significant amount of cargo to Earth. It returned about 2,668 pounds (1,210 kilograms) of science samples, equipment and education activities. Dragon’s rendezvous with the station was delayed by a day after three of four thrusters did not fire as commanded. SpaceX engineers resolved the problem and continued Dragon’s mission to the station after consultation with NASA managers. A third SpaceX commercial resupply services mission is targeted for launch at the end of September. Dragon originally performed two demonstration flights, the first in December 2010 for just two orbits and the second in May 2012. The second Dragon demonstration mission actually arrived at the space station, delivered non-essential cargo and stayed for six days after three days of approach and rendezvous tests. Its first official resupply mission under NASA’s Commercial Resupply Services contract was in October 2012 during Expedition 33 and lasted three weeks.